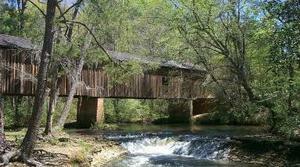 Coheelee Creek Bridge in Blakely, Georgia is the southernmost (historic/authentic) covered bridge in the United States. The construction of this 121-foot bridge at McDonald's Ford was first authorized by the county in 1833, though construction was delayed until 1891. It was completed in four months by J.W. Baughman and thirty-six workers as a modification of the queen post truss design. The trusses have a horizontal cross piece extending across a center post flanked by two compression timbers slanting down and outwards with a set of iron rods slanting down and inwards. The concrete abutments were added in 1958. It is in the center of a recreational area; the Fannie Askew Williams Memorial Park to the north and the access road to the Coheelee Creek Landing and Recreational Area on the south. Camping facilities and a boat ramp to the Chattahoochee River are on the grounds. The area is one of much scenic beauty with small waterfalls, woodland trails, and access to the river bank. Picnic tables are available.